Real-life, out-of-laboratory, measurements of pedestrian walking dynamics allow extensive and fully-resolved statistical analyses. However, data acquisition in real-life is subjected to the randomness and heterogeneity that characterizes crowd flows over time. In a typical real-life location, disparate flow conditions follow one another in random order: for instance, a low density pedestrian co-flow dynamics may suddenly turn into a high density counter-flow scenario and then back again. Isolating occurrences of similar flow conditions within the acquired data is a paramount first step in the analyses in order to avoid spurious statistics and to enable qualitative comparisons. 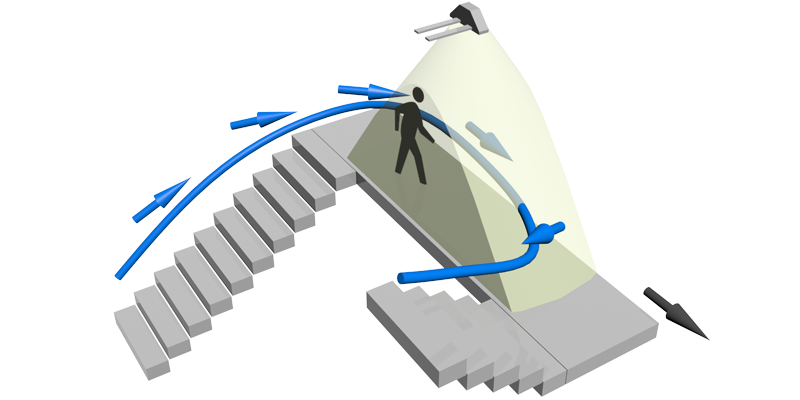 In this paper we extend our previous investigation on the asymmetric pedestrian dynamics on a staircase landing, where we collected a large statistical database of measurements from ad hoc continuous recordings. This contribution has a two-fold aim: first, method-wise, we discuss an analysis workflow to consider large-scale experimental measurements, suggesting two querying approaches to automatically extract occurrences of similar flow scenarios out of datasets. These pursue aggregation of similar scenarios on either a frame or a trajectory basis. Second, we employ these two different perspectives to further explore asymmetries in the pedestrian dynamics in our measurement site. We report cross-comparisons of statistics of pedestrian positions, velocities and accelerations vs. flow conditions as well as vs. querying approach. Microsoft Corp.: Kinect for Xbox 360 (2011). URL http://www.xbox.com/en-us/kinect/. Redmond, WA, USA.